Under Arizona’s Threatening or Intimidating Statute, it’s a crime to threaten or intimidate violence; it’s also illegal to threaten serious property damage. Threatening or Intimidating, under ARS 13-1202, is a serious offense that can be charged as either a misdemeanor or felony. With this charge, there doesn’t need to be physical contact to the alleged victim or property. The victim needs only to report a genuine threat. Furthermore, threatening or intimidating doesn’t even require that the victim actually felt any fear. In re Ryan A. (App. Div.1 2002). Most threatening or intimidating cases arise out of uncorroborated claims from a biased victim. In other words they’re typically “he said, she said” cases. The allegation of threat is often made up, exaggerated, or blow out of proportion. A victim might report the charge out of anger, vindication, or frustration, rather than in response to a genuine concern for safety or property. Additionally, alcohol and drug use may play a role in the allegations. Most frequently, threatening or intimidating is seen in the context of domestic cases where a family member or partner is highly motivated to get back at a defendant. Threatening or intimidating is usually charged as class 1 misdemeanor under ARS 13-1202(A)(1). In rare cases, it’s charged as a class 6 felony if alleged that the defendant made the threat in retaliation to a victim reporting criminal conduct. This felony charge is more common in domestic violence cases whereby a defendant is accused of threatening a romantic partner or family member for calling the police. Threatening or intimidating cases are charged as felonies when involving criminal street gangs. It’s a class 6 felony when a gang member threatens or intimidates. If the threat or intimidation is made to actually promote the gang, or to get someone to participate in the gang, it can be charged as a class 3 felony under ARS 13-1202(A)(3). Misdemeanor Threatening or Intimidating: In most cases, threatening or intimidating is charged as a class 1 misdemeanor. A class 1 misdemeanor carries up to 6 months jail, $3600 in fines and surcharges, and up to 3 years of probation. If charged as a domestic violence offense, the defendant additionally faces losing gun rights and taking mandatory domestic violence classes. Felony Threatening or Intimidating: If the alleged threat or intimidation is made in retaliation to someone reporting a crime, such as in an assault or domestic violence situation, it can be charged as a class 6 felony with up to 2 years prison, or up to 5.75 years prison when the defendant has prior felony convictions. As with any felony, there are severe collateral consequences that can impact employment, finances, and opportunities. The most serious penalties are in class 3 felony cases. Depending on the Defendant’s criminal history, such a gang member faces up to 25 years in prison. It Wasn’t a Truly a Genuine Threat: While the State doesn’t need to demonstrate the defendant acted with wrongful intent, had the ability to carry out the threat, or intended to carry out the threat, the state still must show the defendant communicated a “true threat.” In re Kyle M ., 200 Ariz. 447, P.3d (App.2001). The State must prove a “true threat” by demonstrating that a reasonable person in Defendant’s shoes would think that the statement made would be seen by others as a serious expression of intending to inflict harm or property damage. Arizona Courts have ruled under this “true threat” principal, that only genuine threats are criminal. While the law is still developing, there’s also law to support that a threat isn’t a true one if it’s ambiguous or conditional. Citizen Publ’g Co. v. Miller, 210 Ariz. 513 P.3d 107 (2005). No Threat or Intimidation Was Actually Made: Charges are sometimes fabricated, especially in domestic violence cases. There’s a wide range of motivators in fabricating or exaggerating a threat. Vengeance, blame shifting, anger, cheating, divorce, and custody are common motivators. In addition, alcohol and drugs can also lead to exaggerated or distorted claims. The Alleged Threat is Not Criminal: There’s a difference between rude or offensive behavior and criminal conduct. Arizona criminalizes behavior when it involves fighting, violence, and true threats. Arizona doesn’t make criminals out of people because they act offensive or rude, or because they lack respect or control. 1st Amendment, Free Speech: Free speech is protected by the 1st and 14th Amendments of the U.S. Constitution; however, free speech isn’t absolute. Our constitution doesn’t permit us to use “fighting words.” Fighting words are words that are likely to provoke a violent reaction in normal people. Thus, while crude or vulgar language is protected, fighting words are not. The Supreme Court has ruled that protecting the sensibilities of others is not a sufficient reason to suppress our speech. The fact that speech includes expletives doesn’t strip it from constitutional protection. Cohen v California, 403 U.S. S.Ct. (1971). In sum, cursing, ranting, and raving might indicate immaturity or rudeness, but absent actual fighting words, or genuine threats of violence, the speech is permitted. Self-Defense under A.R.S. 13-404: In Arizona, we may threaten physical force if it appears reasonably and immediately necessary to protect against the use or attempted use of unlawful physical force. Thus, when actually facing physical force, most threatening and intimidation is justified to deter that violence. Threats or intimidation against another is not justified in response to only verbal provocation. It’s also not justified if the defendant provoked the other’s violence. Defense of others: A person is justified in threatening physical force to defend another person if that other person would be justified in defending himself with threats or intimidation under ARS 13-404. Constitutional Violations: Any search, seizure, or detainment must be supported by probable cause or reasonable suspicion. In addition, Miranda violations, and the denial of the right to counsel, can sometimes be raised to suppress evidence or dismiss charges. Recanting Victim: This isn’t technically a defense; but victims sometimes recant their claim. They made the report in anger or vengeance. After they cool down and the dust settles, they realize that they blew it out of proportion or fabricated a charge. This creates an obvious obstacle for the prosecutor. Threatening and intimidating charges are difficult to prove if a witness wants the charges dropped or is uncooperative. When in doubt, always work with a criminal defense lawyer to make your case. 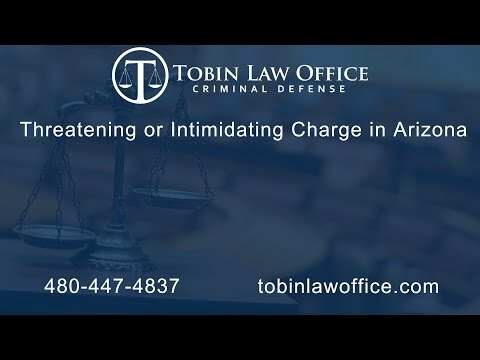 If you find yourself in need of an experienced criminal Mesa defense attorney to assist you with your threatening or intimidation charge, contact us today. Tobin Law Office has years of experience in representing clients just like you.